Doc Watson is a legend in acoustic music, with a unique style influenced by his traditional Appalachian folk music roots, blues, country, gospel, and bluegrass. Despite being blind since infancy, Doc has been making music his whole life and is considered by fans everywhere to be one of the world�s most accomplished flatpickers. Arthel Lane �Doc� Watson was born in Stoney Fork Township, NC, on March 3, 1923 surrounded by music. His mother sang traditional and religious songs, and his father played the banjo. Doc�s first instruments were a harmonica and a homemade banjo, but he soon showed a talent on the guitar. After receiving his first guitar from his father, Doc started playing both family favorites and new material he picked up from records and the radio with neighbors and family. Doc�s talent developed to the point where he supported his family through the 1950�s playing music and tuning pianos. His main occupation was playing electric guitar in a country dance band with pianist Jack Williams, but he also continued to play traditional acoustic music with his friends Tom �Clarence� Ashley, Clint Howard, and Fred Price. A performance with Ashley, Howard, and Prince at Union Grove, North Carolina in 1960 brought Doc together with folklorist Ralph Rinzler. By 1961, Rinzler had arranged for Ashley, Howard, Prince, and Doc to perform in New York City for a �Friends of Old-Time Music� concert, and one year later Doc performed solo for the first time at Gerde�s Folk City in Greenwich Village. For the next several years, Doc made the folk music circuit, playing concerts all over the country and appearing at the 1963 Newport Folk Festival and with Bill Monroe that same year at New York�s Town Hall. Although the popularity of folk performers had waned by the mid-1960�s, Doc continued to tour extensively with his son Merle playing backup guitar and serving as manager and driver. In addition to thousands of concerts, Doc has recorded dozens of albums in his long career. Since his son Merle�s death in 1985, he now only performs occasionally. For the last six years, Doc has hosted the annual Merle Watson Memorial Festival in Wilkesboro, N.C. on the last weekend of April. Doc Watson, a true master of traditional guitar styles and one of the most beloved folk musicians of all time, teaches some of the most requested fingerpicking and flatpicking tunes in his vast repertoire! Split-screen images allow you to watch his picking and fretting hands at the same time. You'll see and hear Doc's guitar playing in slowed-down, close-up detail and with his clear explanations and demonstrations you'll soon be playing his definitive arrangements of "Deep River Blues, Blue Railroad Train, Bluebell, Windy and Warm, Southbound, Black Mountain Rag, Beaumont Rag, Georgie, East Tennessee Blues, Way Downtown, The Cuckoo, Don't Let Your Deal Go Down" and other great folk and country songs. As an added treat, Doc is joined in music and conversation by Pete Seeger, Mike Seeger (banjo), Kirk Sutphin (fiddle), and long-time musical partner Jack Lawrence (guitar), who adds some invaluable pointers on back-up guitar and his own excellent flatpickin style! Doc Watson Plays "Windy & Warm"
Doc sits down with Steve Kaufman, a top-notch flatpicker in his own right, and shows how he plays some of his most beloved songs and guitar instrumentals! He and Steve trade licks and play duets, and Doc slows his playing down so that you will be able to follow along as you learn to play these fabulous tunes. Starting with the old gospel song "Open Up Them Pearly Gates" Doc shows how he uses hammer-ons and pull-offs to easily add notes to his accompaniment. He then launches into a crosspicking solo, moving effortlessly up the neck in simple movable positions that create a complex sounding break. Moving to the classic ballad "Little Sadie" Doc explains how he devises his licks and positions in D minor. On "More Pretty Girls Than One, New River Train, and White House Blues" he slows down the flashy runs that punctuate each line of the song. This is one of Doc's signature guitar techniques that has baffled many students of Doc's guitar style. He then carefully breaks down the solos to each song. Doc and Steve launch into breathtaking versions of classic fiddle tunes "Salt Creek" and "Ragtime Annie" showing you the lead and back-up, as well as the "twin" harmony parts. These show stoppers are also slowed down so you can really see what these two incredible guitarists are playing. Changing gears, Doc teaches his version of the hauntingly lovely "Goodnight Waltz" as well as his improvisations to the country and jazz tunes "When It's Peach Pickin' Time In Georgia" and "Sweet Georgia Brown". Finally, Doc brings on his grandson Richard Watson for a performance of three bluesy songs they have been performing together: "Walk On Boy, Chicago Blues, and Summertime". Doc Watson Plays "Sweet Georgia Brown"
This collection of rarely seen video performances illustrates the power and range of Doc's talents and the evolution of his performance style. The tapestry of sound Doc wove during his first two decades of performing unfolds in these enduring and inspiring performances. Tunes include: "Deep River Blues, Nine Pound Hammer, Daniel Prayed, St. James Hospital, Shady Grove, Black Mountain Rag, Stack O'Lee Blues, Tom Dooley, Southbound, Way Downtown, Lonesome Road, Medley: Nancy Roland / Salt Creek, I Wish I Was a Mole In the Ground, Sweet Georgia Brown, Peach Pickin' Time Down in Georgia, Will The Circle Be Unbroken, Raincrow Bill, Tennessee Stud, Medley: Big Sandy / Bill Cheatham, A Roving On a Winters Night, Black Mountain Rag". Doc Watson Plays "Nine Pound Hammer"
Featuring Doc Watson, Tony Rice, Dan Crary and Norman Blake. Tunes include: "Black Mountain Rag, Peach Pickin' Time Down In Georgia, Bye Bye Blues, Tennessee Stud, Sheep in the Meadow/Stoney Fork, Bill Cheatham/Salt Creek" Doc Watson, "Nine Pound Hammer, Cold On The Shoulder, Whitewater, Freeborn Man, The White Dove, Sally Goodin" - Tony Rice, "Jimmy Brown The Newsboy, Salty, Molly Brown" -Norman Blake, "Country Boy Rock N' Roll, The Fishing Creek Blues/The Blackbird/Turkey in the Straw/Bonaparte's Retreat/ Arkansas Traveler, Lady's Fancy, Black Mountain Rag" -Dan Crary. Doc Watson Plays "The Tennessee Stud"
Doc's accompanists as well as his songs here are an eclectic group ranging from his 1950s musical partner, pianist Jack Williams, to his son Merle (seen playing exquisite slide guitar), to Ricky Skaggs (singing and playing mandolin in a Monroe Brothers style set) to a stellar string band featuring Mark O'Connor, Tony Rice, Bela Fleck, David Grisman and Jerry Douglas. Songs include: "New River Train, Shady Grove, Going To Chicago, Blue Yodel No 12, Sleep Baby Sleep, You Must Come In At The Door, Dear Old Sunny South By The Sea, Amazing Grace, Foggy Mountain Top, What Is a Home Without Love, Nine Pound Hammer, Riding On That Midnight Train, Fire Ball Mail, Medley: Love Me/Tutti Frutti, Shake Rattle & Roll, Make Me a Pallet On You Floor, In The Jailhouse Now, Going To Chicago, Life Gets Tee-Jus, Don't It". 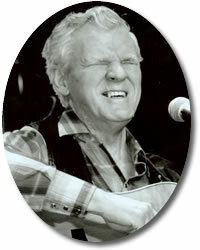 Doc Watson is widely regarded as the finest flatpicking guitarist and preeminent folk artist alive today. In this Ramblin' concert recorded in 1980, Doc is joined by his son Merle on guitar and banjo and Michael Coleman on bass. Their performance is a showcase of native folk traditions and a display of distinctive stylistic inventions. A visit with Doc and Merle at home in Deep Gap, NC and Rock Hill, SC is also included. Songs include "Way Downtown, Sadie, Frosty Morn, Medley: "Big Sandy / Old Joe Clark, Don't Think Twice It's Alright, Summertime, Smoke Smoke, Sweet Georgia Brown, Pallet On Your Floor, Streamline Cannonball, Wild Bill Jones, Natural Born Gamblin' Man, Got The Blues Can't Be Satisfied, I Miss The Mississippi And You, 'Rangement Blues, Medley: Yankee Doodle / Dixie". Doc Watson has known David Grisman since the latter was a teenager stunning veteran performers at New York City folk clubs in the 1960s. Aside from the pleasures of picking with an old friend, the reward of playing with Grisman is simple: "He knows music" Doc says, "That's your nutshell answer. He knows what it's about". Coming from a master musician for whom the gift of music is the only reason worth leaving the sweet comforts of family and home, that is the highest praise. In this unique concert video, Doc and David with their friend Jack Lawrence present their unique blend of country, jazz, bluegrass and folk music. Titles include: "Bye Bye Blues, Shady Grove, Summertime, Sweet Georgia Brown, Hobo Bill's Last Ride, In The Pines, Long Journey Home, Lonesome Moonlight Waltz, EMD, I Don't Love Nobody, Blue Eyed Jane, Kentucky Waltz, Will You Be Loving Another Man, Deep River Blues, Soldier's Joy, Medley: Big Sandy / Salt Creek, Roll In My Sweet Baby's Arms, Roll On Buddy". Recorded live at the 1992 Merle Watson Festival in Wilkesboro, North Carolina, this incredible jam session brings together five masters of flatpicking guitar - Doc Watson, Tony Rice, Dan Crary, Jack Lawrence and Steve Kaufman. Together they harmonize, improvise and burn the strings on a set of fiddle tunes, country classics and hot guitar instrumentals. Two bonus tracks are also included of Doc playing with his friends David Grisman, Bela Fleck, Mark O'Connor, Tim O'Brien, Roland White, Jerry Douglas, T. Michael Coleman and others. All in all, an amazing 60 minutes of great picking. Songs include: "Ragtime Annie, Blue Ridge Mountain Blues, St. Anne's Reel, More Pretty Girls Then One, Walk On By, Little Sadie, Black Mountain Rag, Lime Rock, Billy In The Lowground, Going Down This Road Feeling Bad, What Does The Deep Sea Say, Ramshackle Shack, Wildwood Flower". Doc Watson was a legendary performer who blended his traditional Appalachian musical roots with bluegrass, country, gospel and blues to create a unique style and an expansive repertoire. His flatpicking style elevated the acoustic guitar to solo status in bluegrass and country music, and whose interpretations of traditional American music profoundly influenced generations of folk and rock guitarists. In this DVD, performances of Doc through out his career are presented alongside Doc talking about his life and influences. Titles include: "Shady Grove, Storms On The Ocean, Wabash Cannonball, Peach Pickin' Time In Georgia, Daybreak Blues, Windy And Warm, Black Mountain Rag, Medley: Sheeps in the Meadow/Stony Fork, Beaumont Rag, Keep On The Sunny Side of Life, Monkey Around The Winter, Lost John, How Long Blues, Blue Suede Shoes, Shake Rattle & Roll, Bye Bye Blues, St. James Hospital, A Christmas Lullaby, Lee Highway Blues, Medley: Bill Cheatham / Salt Creek, Deep River Blues, Honey I'm Worried Now, Moody River, The Riddle Song, When I Lay My Burden Down, Sitting On Top Of The World, Got The Blues Can't Be Satisfied, Riding On That Midnight Train, Fire Ball Mail, Tennessee Stud, Daniel Prayed". 14 detailed guitar arrangements are featured in this outstanding Doc Watson collection transcribed note-for-note with tab from his legendary recordings! Now you can learn the songs, licks, fingerpicking, and flatpicking styles that made Doc famous! Songs include: "Beaumont Rag, Black Mountain Rag, Blackberry Blossom, Columbus Stockade Blues, Deep River Blues, Dill Pickle Rag, Doc's Guitar, Little Sadie, Shady Grove, Sitting On Top Of The World, Tennessee Stud, Tom Dooley, Walk On Boy, Windy And Warm". Doc Watson Plays "Dill Pickle Rag"
Features transcriptions of Doc Watson's great guitar flatpicking recordings from the early 1960s until the 1990s taught by Joe Carr. In addition, detailed explanations of special techniques such as Carter Plus soloing, using three note patterns, and numerous crosspicking patterns are included. Exercises are designed to isolate specific licks and patterns, making them easier to learn. Moveable phrases and licks are identified so that players can introduce Doc's unique sound into their own playing. Songs include: "Pretty Little Pink, Cluck Old Hen, Beaumont Rag, Little Sadie, Fiddler's Dream, Whistling Rufus, Ragtime Annie, Liberty Rag, Lonesome Ruben, Dill Pickle Rag, Careless Love, Nashville Pickin, Tammy's Song, John Hardy, Pickalong, Bill Cheatham, Rainbow, Alabama Jubilee, June Apple, Billy In The Lowground, Way Downtown, Tennessee Stud, Banks Of The Ohio, I saw A Man At The Close Of Day, Interstate Rag, Stone's Rag, Tucker's Barn, Bury Me Beneath The Willow, Whiskey Before Breakfast"
Doc Watson Plays "Billy In The Lowground"
Songs include: "Black Mountain Rag, Blackberry Rag, Blue Ridge Mountain Blues, Carroll County Blues, Doc's Guitar, Doc's Rag, Don't Let Your Deal Go Down, Down Yonder, Fisher's Hornpipe / Devil's Dream, Freight Train Blues, I Am A Pilgrim, I Heard My Mother Weeping, New River Train, Rising Sun, Roll On Buddy, Salt Creek / Bill Cheatham, Sheep In The Meadow / Stoney Fork, Sittin' Here Pickin' The Blues, Texas Gales, Tom Dooley, Will The Circle Be Unbroken". Doc Watson Plays "Black Mountain Rag"
Songs include: "Beaumont Rag, Black Mountain Rag, Blue Ridge Mountain Blues, Bonaparte's Retreat, Cotton-Eyed Joe, Deep River Blues, Doc's Guitar, Double File/Salt Creek, Florida Blues, Life Is Like a River, Nashville Pickin', "Rangement Blues, Thoughts Of Never, Windy and Warm, You Must Come In at The Door". Doc Watson Plays "Deep River Blues"
Over 30 favorite songs as sung and played by this great folk musician of the Smokies! Transcriptions are in standard music notation and tab. Songs include: "Froggy Went A Courtin', A-Rovin' on a Winter's Night, Black Mountain Rag, Blackberry Rag, Deep River Blues, Dill Pickle Rag, Doc's Guitar, Don't Let Your Deal Go Down, Down in the Valley to Pray, F.F.V., Fair Maid in the Garden, Georgie, Georgie Buck, Intoxicated Rat, Katie Mory, Lovin' Emma, Matty Groves, Nothing To It, Omie Wise, Open Up Them Pearly Gates, Pharaoh, Pretty Saro, Risin' Sun Blues, Sittin' On Top of the World, Shady Grove, Southbound, Spike Driver's Blues, St. James Hospital, The Call of the Road, The Lone Pilgrim, The Old Man Below, The Train That Carried My Girl From Town, Tom Dooley, We Shall All Be Reunited, Your Lone Journey". Doc Watson Plays "Doc's Guitar"